We would like to invite you to a class that we believe will make a huge difference in the enjoyment of your life and in the lives of your family. Let’s talk about how you can Stay Young The First 100 Years. Now we already know what some of you are thinking. You’re thinking, now wait just a minute, the title sounds catchy but do I really need to know how to stay young for a hundred years? This sounds pretty far-fetched and ambitious! Well, it’s really not – you need to start thinking about what it means for you and your family to live a long time. Let’s look at the facts. In 1900 the average life span was 49 years old. Now there is no question that this was because many people died when they were very young. We didn’t have the kind of cures and we didn’t provide the kind of health care that we provide today – but that is the point! Everybody’s chances of living a long healthy life was much less back then. As a matter of fact, the average life span today is 77.6 years and growing! Scientists from the University of Texas report that by the year 2050 there will be over 800,000 Americans over the age of 100 and many will be living to 150! So what does that mean? 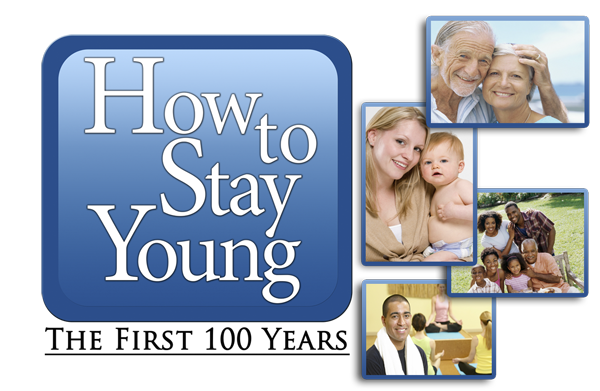 It means your kids need to know more about how to stay young the first 100 years than they need to wonder how they are going to spend their inheritance – because you are probably going to live so long that they may be retired themselves before they even get your inheritance (assuming there is some!)! So YES, this is a topic you AND your family need to know about – If we are going to live for 100 years, we need that long life to be a QUALITY long life! We don’t merely want to be able to exist on this planet – we want to be able to live and work and play on this planet – we want to have a QUALITY life! This is why our presentation is so important to you and your family. 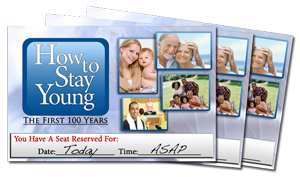 Reserve your seat today and learn the secret of… How To Stay Young! The average life span today is 77.6 years and growing! Studies reveal that by 2050, 800,000 people will be living to be over 100 years old. Long life reveals that we will have health problems after the age of 50 if we don’t do something prior to the age of 50 to take care of those potential problems. This class will teach you how to avoid and prevent spinal disorder in preparation so you can enjoy your extended life!